Author francisPosted on 4 October, 2011 22 October, 2011 Categories psychogeographyLeave a comment on Look up! I’ve always wanted to know exactly where a photograph was taken. I need to know where the rusty mailbox, the home-made number or other small detail is located. I have solved this with an iPhone app, PlaceTagger. I record my locations, while wandering around taking pictures. Then, on my MacBook Pro, I import my pictures into Aperture and use the PlaceTagger plugin to geotag them using the data recorded on the iPhone. I recently discovered a WordPress plugin with which you can add geotagging to posts. There are three parts to this feature: built-in geotagging via the iPhone WordPress app, geotagging via the WordPress add/edit post page and geotagging display on the post itself. When using the iPhone WordPress app, you can automatically add your current location to the post. The add/edit post page allows you to geotag by entering an address – it appears you have to enter a complete address (address, city, country) for it to work. A geotagged page includes a hyperlink indicating the location chosen for the post – move the cursor over the hyperlink and a small map pops up showing the location, click on the map and a new Google Maps window opens where you can explore via Street View or by using other Google features. This further enhances the psychogeographic aspect of this blog. Sadly, the trip is over, but I’ll post more photos soon. Author francisPosted on 15 September, 2011 22 October, 2011 Categories bliss, general revelry, kultur, la nostalgie, le métro, notable, photo op, psychogeography, serendipity, travelling1 Comment on Ça, c’était Paris! My very, very good friend François was gracious enough to allow me to join him and his very lovely girlfriend and his equally lovely niece to see the Orchestre de Paris at Salle Pleyel this evening. The programme included a piece by Berlioz, a concerto by Chopin and Beethoven’s Symphony No. 5. The real treat was the pianist for Chopin’s concerto – Jan Lisiecki. I didn’t recognize the name but I read the programme and discovered he is the Canadian child prodigy I had seen in the CBC documentary hosted by John Schlesinger, ‘The Reluctant Prodigy’. He was superb, his nimble fingered playing brought the house down – he played two encores. It was his début with l’Orchestre de Paris. The other pieces were fantastic as well. The conductor, Paavo Järvi was amazing to watch, he uses his whole body to conduct – beautiful movements. The acoustics in this room are crystal clear – it has recently been renovated, and there are many classical and jazz recordings from Salle Pleyel. We returned to François’s place for an impromptu late supper and then I took one of the last métros home. A perfect Parisian evening to end my trip. Le Baratin. 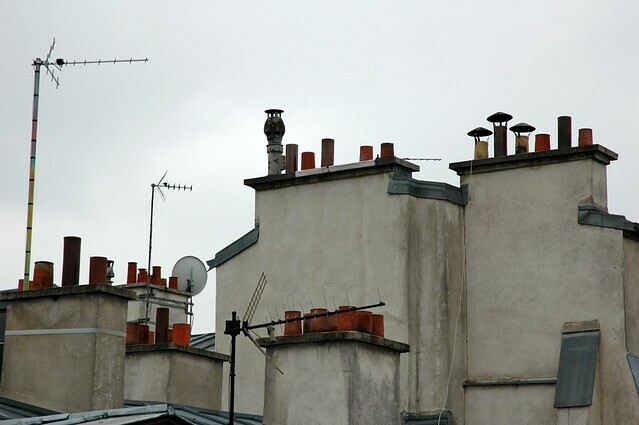 3, rue Jouye-Rouve. Belleville (20th). Recommended by Time Out. I really enjoyed my last restaurant meal. The chef, Raquel Carena is Argentine and the food is very good. The wine was superb. 1) Pouilly-Fumé Alexandre Bain, 2009. Fenouils à l’orange. … that I have almost no photographs of famous monuments. That’s the point of this trip. My favourite Serge Gainsbourg song (though that changes once in a while) is about another song – Les feuilles mortes (Autumn Leaves). Serge’s song is called La chanson de Prévert (Prévert’s Song) – lyrics by Jacques Prévert with music by Joseph Kosma. Here are the French lyrics, with the English translation by Alex Chabot. 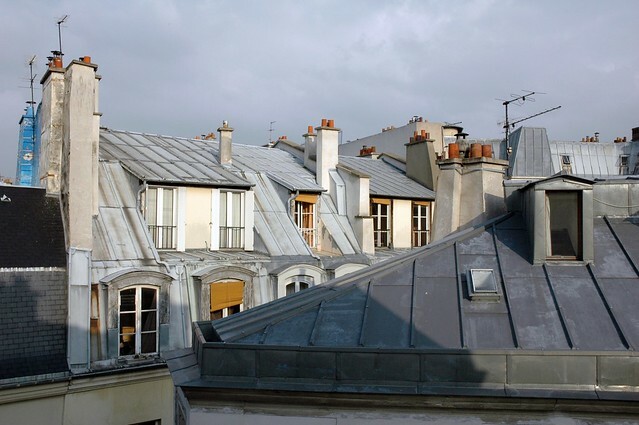 The studio I’m renting is on Rue Saint-Sabin. it’s very residential with some offices. The only restaurant on the street is Amici Miei, an Italian restaurant that specializes in pizza. Every evening, when I walk by, there are about a dozen people waiting to get into a stuffed-to-the-gills room – I can never get in. This evening there was no one waiting outside, so I went in, and amazingly, there was a table available. The ambience is wonderful – bustling, but not too noisy, with delicious aromas (am I mixing my senses here?) emanating from the kitchen. I had the Carpaccio de pesce spada e melone (espadon et melon / swordfish with melon) as antipasti and Linguine alle vongole (palourdes / clam). It was all delicious, particularly the linguine. A 25cl carafe of red rounds everything off perfectly. it is well reviewed on the web. Save at lunch with a sandwich, splurge at dinner. Later I met up with my very good friend François and his god-daughter Ivana for a beer. Imagine having a Guinness in Corsican bistrot called Hall 1900. Serving socks for over twenty years. All the big department stores have these walls. I used to buy my Burlingtons from La Samaritaine, which sadly closed in 2005 – the buildings were declared unsafe – they were declared historic monuments in 1990. Serge Gainsourg (Lucien Ginsburg) is buried with his parents Olga and Joesph Ginsburg in Cimetière du Montparnasse. There are always a lot of offerings from his fans – notes, métro tickets, cabbages, etc., all relating to song lyrics, quotations or moments in his life. Serge Gainsbourg died on 2 March 1991. At the time I knew almost nothing about him – perhaps I had heard only one song: Je t’aime… Moi non plus. I watched the state funeral on TV and couldn’t believe how it brought the city to a standstill. I had to find out more about him, I started listening to his CD’s and fell in love with his music – I loved his word play, double and triple entendres that I don’t pretend to understand all of. (I recently discovered that Alex Chabot is translating the lyrics into English, so we Anglophones can finally “understand what Gainsbourg was saying in each song, and not always how he was saying it”. Alex Chabot: My Own Role – The Lyrics of Serge Gainsbourg in English – pay him a few sous so he can continue the good work). He was a legend before he died and he still is influencing French music from beyond the grave. His daughter, Charlotte, has preserved his home on Rue de Verneuil (where he died). The front wall is filled with graffiti homages to him – layer upon layer have been added these past twenty years. I thought I’d climb the stairs of Cathédrale Notre Dame de Paris to take photographs of the gargoyles, but there were too many tourists. What are they still doing here? I’ll have to make do with a photograph from 1991. What is it? Perhaps they’re transporting a movie submarine down the Seine.